When the ammonite is sliced in half as this one was its chambers are evident. It is believed that the animal closed off the chambers as it grew and that it occupied only the outermost chamber. Experiments with model ammonites suggest they were good swimmers. They apparently controlled their buoyancy by way of a living tube which threaded its way through the septae and enabled the animal to move sea water in and out of the chambers through a hyperosmotic active transport process. Pretty clever, huh? Pliny the Elder gave ammonites the name ammonis cornua ("horns of Ammon") because the god Ammon wore a headdress of ram's horns (that was after the Egyptians conquered Kush and Ammon merged with the Kush ram-headed deity) and of course many ammonites grow as open spirals that look even more like ram's horns than these earrings do. (Do you ever marvel at how many things Pliny studied and classified?!) Later, in Europe, ammonites were understood to be snakes petrified by St. Hilda or St. Patrick, and Wiki says that enterprising merchants sometimes carved snake heads on the "serpentstones" to enhance the illusion. And now we are quite sure that they were living animals with hyperosmotic active transport pumps and anaptychi which functioned as specialized jaws. When your great grandchildren study these earrings, how will they understand them? 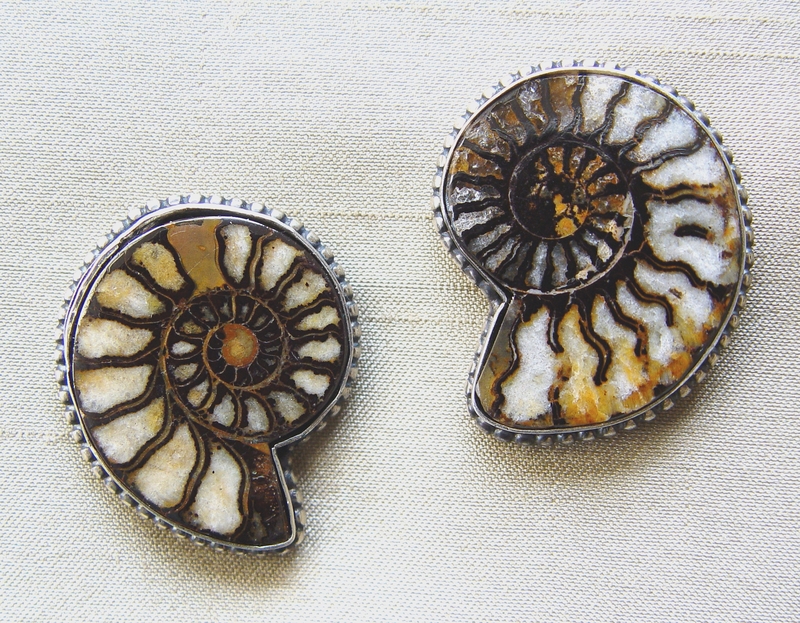 Musings aside, these little fossils are very beautiful and I do hope you will order them. 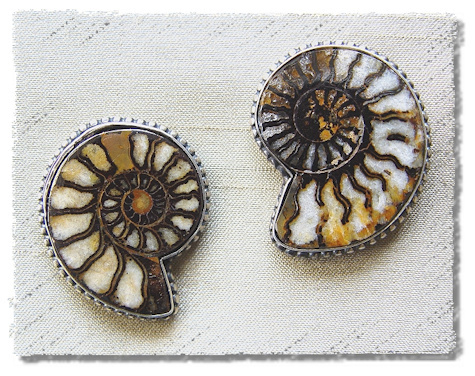 Perhaps you will even hear the murmurings of an ancient sea when you wear them.